An introduction to the life and work of George Brown, and his collection of ethnological artefacts. Since its opening in 1977, the National Museum of Ethnology has been actively involved in ethnological research in Oceania, and has maintained a permanent exhibition on the region. In 1985-86 the George Brown Collection of ethnographic artefacts was purchased by our museum from the University of Newcastle on Tyne, in England, UK. 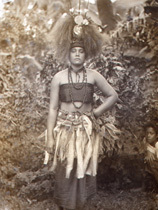 The collection is historically and culturally significant because it was made largely through the efforts of one collector, the Reverend Doctor George Brown, in a sustained, decades-long effort that accompanied his work as a pioneering Methodist missionary in the Pacific Islands. It is also significant because it forms a material record of topics that the collector discussed in his ethnographic and missionary writings. And of course, it is also significant because it represents an assemblage of cultural treasures that the peoples of many Pacific islands can turn to for insight into the lives of their own ancestors. National Museum of Ethnology, Osaka, Japan. National Museum of Ethnology, Osaka, Japan, All rights reserved.